For runners, it doesn’t allow the athlete to extend the hip to engage the glute. Hip IR should be tested in two positions, because different structures can limit your range of motion depending on whether the hip is extended or flexed. The second test is actually a mobilization for improving hip IR if and when progressed properly. Sit at the end of a table, with your knees bent over the side, and hold onto the table itself. Now internally rotate the hip, without abducting or side bending, which is a sign of compensating with the lower back. Generally speaking 35 degrees is good in the general fitness population and 40-45 degrees in competitive athletes. A quick check to see if you may simply have a "lazy" side if one leg has better hip IR than the other. Perform a side plank on the side that's lagging and reassess. It should improve if it's simply an activation problem, otherwise it helps to narrow down the problem to a structural/muscular or alignment (though not very common) problem. Set up on all fours with hands under the shoulders and knees under the hips. Maintain a slight arch in the lower back and place your right foot on the back of your left knee. With your back set sit back into your right hip and hold for a 1-2 count before moving back. Perform 5-10 reps on both sides. Exaggerate the width between your feet. Think about trying to internally rotate your femurs which as a result have your knees touch together while keeping your feet on the floor. Hold for a two count and return to the starting position. The stretch should be felt in the hips and not the knees. Perform 8-12 reps before working out. Good for those with muscular restrictions. Lie on your stomach with your knees together and feet up in the air. Keeping the knees together, let the feet fall out to the sides. Hold for a two count and return to the starting position. Perform 8-12 reps prior to workout. This is great in particular for those with a capsular restriction. This goodie comes courtesy of Dean Somerset. This is more of an advanced stretch and would be sure to be able to knock out all the above aforementioned ones before using this one to help maintain proper hip IR. Sit at the end of a table or elevated step and lift one leg back into internal rotation as shown. Progressively work your work close to the table, and hold for 30 seconds. Repeat on the other leg. I hope that this post will help steer you in the right direction to improve your lifts in the gym and your times on the trail. If you should have any specific questions please shoot me a message and I'll be happy to try and help out. If any of this information was insightful, helpful or funny please share it with a friend! Walk through your local gym you'll see dozens of personal trainers stretching their clients. No doubt this has been going on forever, but is technically outside of the personal trainer's scope of practice. Scope of Practice- Procedures, actions, and processes that a healthcare practitioner is permitted in undertaking. Nowhere in there does it mention any sort of muscle manipulating techniques. Hey can you move back to that other spot...a little lower....YEAH! OUCH! You got it. This was a typical exploratory palpation session with clients whenever they were unable to release muscle on their own and so it made sense for me to get it out for them so we could get back to training. When I started doing bodywork I had already been a trainer for over 5 years and was decently versed on anatomy and biomechanics. This all is a rationalize for what I was doing, which was outside the guidelines of my liability insurance and scope of practice. The results I got were positive across the board, but I also knew I wasn't allowed to do what I was doing. The more injuries I would encounter, the better I got at feeling healthy tissue and fibrous restrictions in the fascia and muscles. Though in the back of my mind I knew what I was doing was illegal. I observe dozens of coaches, many of whom I see jam their elbows and fingers in areas where they shouldn't be. And not because now that I'm a manual therapist I'm on my high horse but because they're actually pressing down, rather hard I might add given the discoloration of the skin around said area, into a place where there's way too many nerves or organs. I will never tell any other coach they shouldn't be placing their hands on their clients, because that would make me a giant hypocrite. I do however advise these coaches to exercise ALOT of caution. In an effort to add value to sessions coaches range from the harmless assisted static stretching to downright dangerous let me dig my elbow into your anterior triangle. A Manual therapist, massage therapist or LMT has undergone more extensive training than personal trainers where it pertains to understanding of how and more importantly WHY to work in a given area. They learn more manual muscle testing and specific assessments to address movement compensations. I could copy a technique but didn't fully grasp the methodology behind it. Most trainers who perform assisted soft tissue via foam roller, ball or roller stick think: harder is better. It's not. Copying a given technique performed on you might help YOU, but could injure your client. In the same way you wouldn't give a 65 year grandma the same exercise protocol a 25 year old would receive, the same goes for soft tissue manipulation. In the past I've seen coaches receive a quickie treatment only to see them performing the exact thing on their clients that same evening. I hadn't earned the right to put my hands on clients. Trainers are not therapists. Many colleagues who are both manual therapist and trainer had to juggle massage therapy school and a full slate of clients at the same time. Depending on where they're located, schooling can range from 500 hours to over 1000 hours. And while this may be a lot or a little depending on how you look at it, it's a large commitment for anyone with full time obligations. Trainers are not physical therapists. Most of the corrective exercises seen today don't work because the coach implementing them lack an understanding that the issue needs both manual therapy and corrective exercise. I understand now I had not earned the right to put my hands on a single client because I had not committed to fully understanding the topics above. I had not put in the time, literally. I thought because I could recite muscles and actions off the top of my head that I could manipulate muscles. I was wrong. On one hand all the clients I've helped has allowed me to get a head start on my education in treating soft tissue restrictions but I also understand I probably shouldn't have ever laid a hand on a single person, no matter the outcome. Lower back pain is something most of us will deal with at some point in our lives. You bend over to pick up your kids or tie your shoelaces and BAM! out of nowhere your back goes out. An overwhelming number of low back injuries stem from chronically poor body mechanics and even more likely from poor everday posture. If you’re reading this on your phone, take a moment to sit up straight and pull the phone up so your neck isn't being cranked downwards. For those who suffer from extension based back pain this is likely caused by: Short Hip flexors, poor glute activity and a lack of anterior core stabilization. The combination of weak glute function with shortened hip flexors often leads to lumbar extension substituting for hip extension during activities such as deadlifting, jumping, and running. Put simply if you aren’t putting your glutes into it, you back will be. 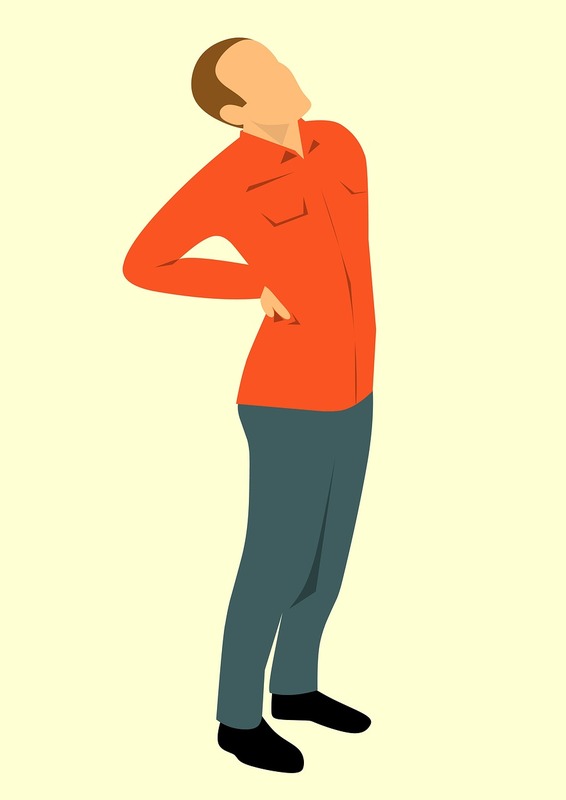 A sure fire postural sign a person is a candidate for extension based back pain is viewed from the side via anterior pelvic tilt, or the back of your pelvis is higher than the front. Flexion based back pain often afflicts those who sit for long periods of time like office workers or truck drivers. The main muscle that creates problems for these individuals is the Psoas. This is the only hip flexor that remains active once you draw your leg up above 90 degrees. Those seeking hip flexion like during a squat will get lower back rounding instead. Their problems are aggravated by a host of other factors such as: Poor glute function, cervical spine positioning, lack of thoracic spine extension and poor anterior core stability. Someone with this type of back pain is in a catch-22. They need to stop sitting so much but they likely sit a lot due to work. For this individual I would recommend setting a timer to periodically stand up and stretch to break up the monotony. Along with taking time each day to use a foam roller or lacrosse ball to break up any soft tissue adhesions formed in the hip flexor muscles. From an anatomical standpoint the hip flexors are a combination of muscles: illiopsoas, sartorius, and rectus femoris. Lets focus on the Psoas. The psoas attaches through the side of the lumbar spine and connects to the discs in the area of T12-L5. Because of this vertebral origin point, the psoas is also involved in 360 degrees of spine stabilization. For those who believe they have chronically tight hip flexors, stretching them isn’t going to magically solve the problem because the underlying cause may not be tight hips but an unstable spine and poor core strength. If a muscle is short and tight, stretching it won’t release any neural tone which only leads to it tightening back up afterwards. Their issues may be solved simply through core and glute activation. A properly performed plank will solve all that ales you. Not only because by staying in a neutral position will you decrease recruitment of the illiopsoas but also by squeezing the glutes hard you’ll force the muscle to relax due to reciprocal inhibition. The muscles that resist internal rotation are all located on the outside of the hip. By stimulating these muscles it forces them to all stabilize the spine and possibly allow your hips and core to work correctly. On the other side of the equation are the muscles that resist external rotation found on the inside and anterior aspect of the hip. All these muscles co-mingle when it comes to core stability. Like in the aforementioned tip, when a properly performed prone plank is performed, the hip flexors are held in a tight stretched position to help the hips and spine stabilize. Correcting these restrictions can bring relief to those suffering from chronic lower back pain. These screen are the beginning to figuring out if you need more mobilization or simply needed more stability. The thoracic spine/ribcage is the boss when it comes to deciding where the scapula sits. Trainers and coaches find that if an athlete is having trouble with overhead movements, thoracic extension and the muscles involved must be mobilized. Some lifters don’t respond well to traditional t-spine exercises like thoracic extensions or back-to-wall slides, no matter how many times they're performed. For these individuals those particular drills and mobilizations don't help because they're already stuck in extension. The goal is to try and move them into a more neutral position where the diaphgram and pelvic floor face each other. This allows for the upper back to move into extension thus allowing better movement and less strain on secondary breathing muscles. Improving your squat requires reps, so too does your breathing. By fully drawing in air and exhaling, you'll improve your rib and thoracic mobility. By correcting this it will free up a majority of shoulder impingements at the top of pressing movements. I have had countless clients attempt to breathe deeply only to be able to take in air for 2-3 seconds at most. I would add that these clients often exhibit dysfunctional breathing muscular restrictions like overactive scalene, sternocleidomastoid, levator scapulae, pec minor and traps. Before beginning, if you're a female in the Los Angeles area looking to make long lasting changes and lose that stubborn weight, click on the link above in my profile for details👆🏼😬 *️⃣*️⃣*️⃣*️⃣*️⃣*️⃣*️⃣ 90-90 hip lift with balloon. If you change your breathing mechanics, you can drastically improve your thoracic mobility. Using a balloon is an amazing tool to teach you how to better engage the muscles needed to stabilize the trunk and creating intra-abdominal pressure voluntarily. How to: Lie on your back with your feet flat against a wall. Knees and hips at 90 degrees. Stick your tongue to the roof of your mouth in order to maintain pressure. The hip lift encourages posterior tilt by trying to engage your hamstrings not the abdominal muscles. 1) Begin with an exhale to set rib position. The goal is use a minimal amount of oblique contraction to the ribs down during inhalation 2) Exhale fully through mouth without clamping down on your rectus abdominis (6 pack muscle). 3) Pause 2-3 seconds before inhaling again. Inhales and exhales should be relatively effortless. Limit straining, keep a relaxed neck. 4)Expand chest 360 degrees. Chest should expand, not rise towards the shoulders. I learned this trick from the Postural Restoration Institute (PRI). The balloon is an amazing tool to teach you how to better engage the musculature needed to stabilize the trunk, create and release pressure voluntarily. Really honing this skill has immense carryover to all lifts and movements. Try to not pinch off the balloon with your teeth. Stick your tongue to the roof of your mouth in order to maintain pressure. The arm lift helps to facilitate opening up the chest and the hip lift which encourages posterior tilt where you are trying to engage your hamstrings. Begin with an exhale to set rib position. Exhale fully through mouth without clamping down on your rectus abdominis (6 pack muscle). Pause 2-3 seconds before inhaling again. Inhales and exhales should be relatively effortless. Limit straining, keep a relaxed neck. Expand chest 360 degrees. Chest should expand not rise towards the shoulders. I believe most people would benefit from performing more side plank variations as it will increase lateral stabilization and often times fix most internal hip rotation restrictions. A side plank targets muscles like the Quadratus Lumborum, Lats, Obliques, and the Rectus Adomonis. The best part of this movement is that as you rotate in and out of the plank variations you'll have to get tight throughout the body and resist both extension and lateral rotation forces on the body. Begin in a prone plank position with your arms at 90 degrees, one in front of the other. Brace into a plank position, deep exhale as to set the ribcage in the proper position and to achieve a strong core brace. Rotate onto one side while simultaneously rotating the feet to help facilitate a proper side plank position. Careful to not lose proper "shoulder stacking", meaning you should not feel ALOT of pressure in the front of your shoulder while doing this. Rotate back to the prone plank and then repeat on the other side. Perform 8-12 passes total near the end of a workout.